A gift economy is a mode of exchange where valuables are given without an explicit agreement for immediate or future rewards, distinguishing it from a barter economy or a market economy where there is an explicit exchange of goods or services for money or some other commodity. 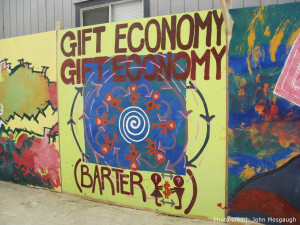 So how does a gift economy play out in real life? Take the people of Anuta, an island in the Solomon Islands archipelago. They maintain a modern gift economy on their tiny island by practicing a philosophy they call Aropa, which emphasizes collaboration, sharing and compassion for others. Lots of things are shared freely among the families on the island, everything from land to food, so nobody ever struggles next-door to prosperous neighbors. All the islanders are responsible for farming patches of land, and since they practice a sort of crop rotation, highly prized yet delicate crops are given freely to families currently stuck farming sturdier, less desirable items. A few folks on Anuta do occasionally earn money (fisherman, for example, and islanders who travel to other lands to work), but that money is mainly used to purchase manufactured goods which are brought back to the island for people to share and share alike. The practice of Aropa ensures that the island’s finite resources are divided equally among its inhabitants. Because Anuta’s high population density has not had a negative impact on the island’s ecosystem, Anuta has attracted interest from scientists interested in sustainability. The BBC documentary series South Pacific devotes part of an episode to the ability of Anutans to maintain their island’s bounty, contrasting it with the environmental destruction found on Easter Island.